Nursing pillows are a versatile and much-loved addition to your baby gear collection. There will be few items that get as much use as your nursing pillow and they help with avoiding spit up. 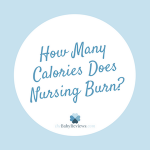 Given how much use your nursing pillow will get, let’s give some thought to what you want out of one. Below we are going to compare and rank some of the top nursing pillow brands so you can decide which is right for you. Despite its somewhat silly name, this pillow means business and is my vote the best nursing pillow on the market! It has fans ranging from celebrities to everyday moms. Secures to mom’s body, so the pillow stays snug. Convenient pocket for holding essentials. The belt has a silent Velcro release which allows you to take off the pillow without startling your baby awake. The pocket keeps everything you need at your fingertips. The pillow gives even first-time moms the confidence that they are in the proper position making learning to latch and breastfeed less intimidating. The pillow adjusts as your body changes and keeps your back, elbows, and arms supported. The foam in the pillow holds its shape well. The Velcro release is only available on the deluxe models, and the original design is buckled. Just be aware of this. The fabric cover tends to soak up every little stain, and the pillow is hard to keep clean in comparison to other brands. You probably already know this pillow’s name by heart as the original Boppy made its debut back in 1989 and quickly became a fixture throughout the 90s as a must-have piece of baby gear (they now make a great baby seat as well). Two-sided with a firm surface on one side and a soft surface on the other. Removable and adjustable belt for a secure fit. Firm side features a contoured foam insert. Machine-washable after removable of foam insert and belt. A double latch belt system makes it easy to open whether the baby is nursing on the right or left side. Easily adjustable with the belt system. The pillow is nice and thick providing great support for young babies. The firm side is nice for newborns, and the soft side provides just the right support for growing babies. The whole pillow is washable after you remove the belt and foam insert which makes clean-up a breeze. The pillow works just as well when the straps aren’t used. The height of this pillow may make it less accommodating to larger babies or moms who have shorter torsos. 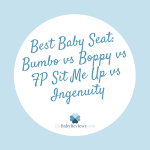 It does not work as well as the Original Boppy for supporting your baby while they are sitting up, so keep that in mind if you want the versatility of the original. It is on the small side compared to some nursing pillows. We are going to be looking at the Deluxe which offers a unique vibration feature to soothe babies that set it apart from most other pillows. Narrow sides to fit in most rocking chairs and seats comfortably. Soothing vibration inserts to keep baby calm. Plastic wipes off easily for clean-up and covers are removable. The vibration system can be a lifesaver for a new mom working on her hold with a fussy baby. The narrow sides make sitting in chairs with steep sides much more comfortable. No buckle systems for moms who would rather not have to deal with that sort of thing at 3 a.m. feedings. It is a narrow pillow in general and may not fit all body shapes comfortable. The pillow is flimsy in comparison to others and may feel less “substantial” to moms making them not as relaxed. The Brest Friend has the years and the following to back up its claims. We loved the support and let’s face it that pocket alone is worth its weight in gold. It has what new moms need most, and that’s the confidence to get through those first few months. In the end, the decision is yours. No matter what you pillow you choose from our list, we think you will have a great addition to your nursing arsenal of must-have gear. Happy nursing!